All sessions are catered to your specific needs. Pricing may vary, and all Massage Therapy and Body Care Services require a scheduled appointment, so please click the "Schedule Online" link located at the right of this page for more info and to book an appointment. A therapeutic and relaxing massage focusing on the shoulders, face, neck, and scalp followed by a pressure point foot massage. 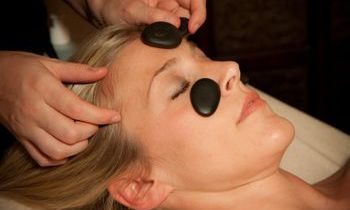 Aromatherapy is included, and hot or cold stones may be added for an additional charge. For those with upper body tension the neck, back, shoulders and arms will be concentrated on. Lower body will include work on the legs and feet. This therapy may also include stretching and range of motion techniques to enhance a positive outcome. The most common form of massage, full body Swedish relaxes the muscles and eases aches and pains. Long flowing strokes create a Zen like state of mind for you and send you off into a dream land. For additional time, steam towels, your choice of aromatherapy, a hand or foot scrub or paraffin treatment and dreaminess chose the "Deluxe" version. This service combines all the different types of massage into one glorious treatment. A little bit of swedish, a little bit of deep work, peppered in with some Ashiatsu all topped off with some reflexology. It's whatever your body needs most! This treatment includes steam towels and aromatherapy. Ashiatsu is unlike any deep tissue massage you have ever experienced! "Ashi" means foot, and "atsu" means pressure. Using support bars overhead, the practitioner creates a technique that delivers a consistent deep, luxurious massage and correct application provides deep relaxation. For a more detailed description, please hover over the massage Therapy Service tab, and visit the Ashiatsu page. This Flowing and rhythmic therapy seamlessly melds western stretching and eastern energy line work into a wonderfully sedating session. It will lengthen short overworked muscles, help to improve range of motion, and move stagnated energy out while bringing revitalizing energy in. This therapy requires the client to wear loose fitting long sleeved clothing, which will allow the therapist to stretch the clients body through it's range of motion. It is preformed on an elevated massage table for client comfort and the therapist uses overhead bars for support and balance. A wonderfully relaxing massage that incorporates heated basalt stones for a deeply penetrating treatment that melts away soreness. As the warm stones relax the body, the mind is calmed retreating into a deep meditative state and in this meditative state your body becomes re-energized.The penetrating heat also helps to relieve pain associated with arthritis It improves blood circulation keeping your heart healthy. The therapy also helps stimulates the flow of oxygen and nutrients helping your body to detoxify and heal. This is a 1hr and 30 minute treatment that includes a full body swedish massage with extra attention paid to the neck, face and scalp. This treatment also includes aromatherapy of your choice. A 2 hour treatment consisting of a full body relaxing swedish style massage with extra attention paid to the hands and the feet.